The Mursi (or Murzu) are a nomadic cattle herder ethnic group located in the Debub Omo Zone of the Southern Nations, Nationalities, and People's Region in Ethiopia, close to the Sudanese border. According to the 2007 national census, there are 7,500 Mursi, 448 of whom live in urban areas, of the total number 92.25% live in the Southern Nations, Nationalities, and People's Region (SNNPR). Surrounded by mountains between the Omo River and its tributary the Mago, the home of the Mursi is one of the most isolated regions of the country. Their neighbours include the Aari, the Banna, the Bodi, the Kara, the Kwegu, the Me'en the Nyangatom and the Suri. They are grouped together with the Me'en and Suri by the Ethiopian government under the name Surma. The Mursi have their own language, also called Mursi, which is classified as one of the Surmic languages; it is closely related (over 80% cognate) to Me'en and Suri, as well as Kwegu. 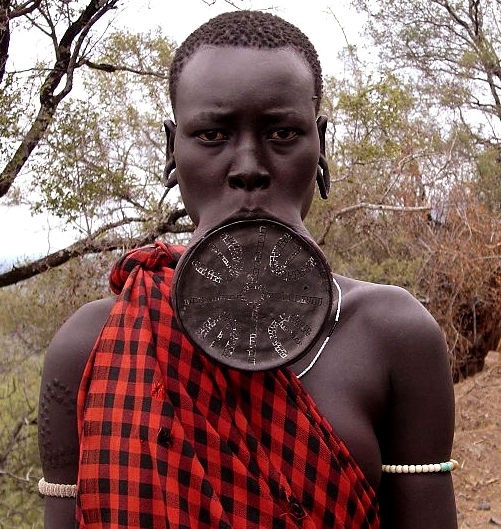 Two orthographies for the Mursi language exist, one Amharic-based and the other Latin-based. The former was developed by members of the missionary organization Serving In Mission, who have worked amongst the Mursi at Maki since 1987. The Latin-based orthography was developed by Moges Yigezu of Addis Ababa University. The religion of the Mursi people is classified as Animism, although about 15% are Christians. The 1994 census reported that 97% of the Mursi were illiterate. The Mursi women are famous for wearing plates in their lower lips. These lip discs are made of clay. Girls are pierced at the age of 15 or 16. Similar body ornaments are worn by the Suyá people, a Brazilian tribe.